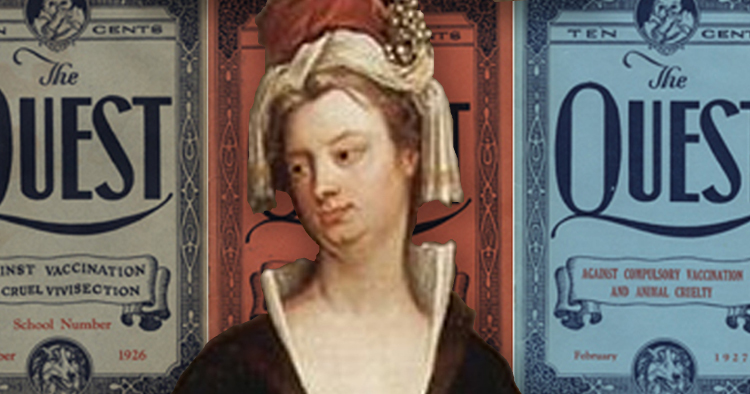 Lady Mary Wortley Montagu was a very well-travelled eighteenth century aristocrat whose husband was appointed ambassador to Istanbul. Fortunately for us, she was also a prolific letter writer. Her legacy is still in print today. 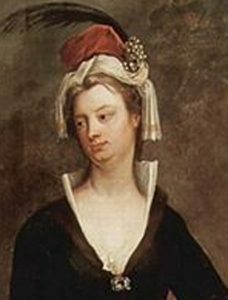 Lady Montagu had been scarred badly by a bout of smallpox in her youth. She was fortunate; many who contracted smallpox at the time, like her own brother, died. So when she found out about a Turkish procedure to safeguard against severe smallpox, she had her son treated. She went on to introduce the habit to some of the upper classes in England, the Royal children among them. This was against considerable resistance from the medical profession of the time, but I’ve written about exactly how useful they were in that era here. ‘Variolation’ is the introduction of a small quantity of the milder of the two forms of smallpox – Variola minor – into a subject. Given that the dose was tiny, that it was of the mild form of the disease and that it may have been administered via a cut in the skin (rather than by inhalation), the effect was to produce antibodies against future infection, but not the full-blown disease. Edward Jenner later used cowpox pathogens to achieve the same result. Both of these procedures are inoculation – introduction of live pathogens – rather than vaccination which uses ‘dead’, attenuated or partial viruses. I write ‘dead’ in quotes because I seem to remember that the concept of life as applied to viruses has some considerable philosophical encumberances. It’s fascinating, but we don’t need to worry about it for the purposes of this blogpost. Smallpox has now been eradicated. It probably exists somewhere in a military laboratory. Let’s hope the custodians are on our side. Major efforts are being made in polio eradication too and the fight has gone well but for several setbacks, one of which was a conspiracy epidemic in Nigeria where people thought that vaccination made girls sterile. Memes can kill. In the UK variolation was made illegal in 1840, but that was OK because the same act of Parliament provided for a free vaccine which had been developed since Lady Montagu’s day. In 1853 vaccination of small children became mandatory, and other acts covering other classes of person came in later. In the late 19th/early 20th century, there were get-out clauses of varying efficacy for those with conscientious objections to vaccination. But by then, they were far less likely to suffer anyway, since they would have benefited from the prophylactic effect of herd immunity – everybody else’s vaccinations. In the USA in 1905, Jacobson vs Masachusetts reached the Supreme Court where it was determined that states had the authority to impose compulsory vaccination. Sometimes, the rights of the few must submit to the rights of the many. Which seems to have created quite a backlash at the time. I was in New York a couple of weeks ago and went to a couple of flea markets in the Chelsea district. It’s between the old meatpacking district and Hell’s kitchen. If you don’t think that sounds too salubrious, it wasn’t. Now however, it’s been yuppified and you can buy vintage brass sconces for $275 (They were pretty, but I didn’t). Instead, I went for a few copies of The Quest: September 1926, February and April 1927’s editions. ‘The Quest’ had been published in Brooklyn for ten cents a copy, and its mission had been ‘against compulsory vaccination and animal cruelty’. This really was a niche publication. I’ve Googled it and have had a very hard time finding out much about the magazine or the publisher. But I can tell you that Louis S Siegfried seems to have published at least one other other anti-vax publication (Spivak, John L. The Medical Trust Unmasked: The Story of a Gigantic Conspiracy – Louis S. Siegfried,1929, 1930, 1961 – a first edition seems to go for about USD25) and may have spent some time in jail for his beliefs. Here is an article he wrote asking ‘Is Vaccination Harmless’. “I demand the right of a public school education for my boy and I can’t see why he shouldn’t get it. I object to vaccination and I won’t submit my boy to such a dangerous practice. Mrs Burns was found not guilty – although quite how, I’m not sure. February 1927 has a page on ‘What Physicians say about VACCINATION’, opposite a page which entreats people to ‘Stop Pus Squirting’. Page 5 covers the furore surrounding a leading article in the Lancet (September 4th and October 9th 1926?) in which a causal link was claimed between death due to encephalomyelitis (inflammation of the brain and spinal-cord) and vaccination. It’s a fascinating piece of social history. I’ve put a couple of pdfs here so you can read if you’re interested. The three oft-repeated errors in ‘The Quest’ are argument from authority (there appear to have been plenty of anti-vax doctors willing to write), confusion of correlation with causation and conspiracy theories citing vested interests who were allegedly pushing vaccines for financial gains. I’m not sure whether the vaccinations I received as a child were administered under a legal compulsion. It wouldn’t have made a difference though. My grandmother’s and mother’s generations saw whooping cough, polio and tuberculosis first hand. They couldn’t believe their luck that these conditions and others could be prevented safely and for free. But it seems we’re now taking our good health for granted. Despite the evidence that vaccinations are safer than outbreaks, anti-vax is on the rise in a generation which has not experienced much epidemic disease. Andrew Wakefield’s 1998 ‘Lancet’ paper drawing a link between autism and vaccination has been discredited, but large swathes of the confident middle classes – ‘over-Googled people’, as they were described to me at a US vaccination drive recently – are refusing to have their children protected. I love vintage publications and enjoy reading the voices from history. It’s interesting to see that anti-vaxers have gone from being doctors (in Lady Montagu’s day), to anti-federal individualists, some with religious interests (early 20th century) to middle-class worriers with benzadrine-type levels of Google usage. But wouldn’t it be nice if the anti-vax message of ‘The Quest’ wasn’t still so current?